iBlogger 2 will enter beta testing this week. It brings several of the most requested features, and provides the most advanced mobile photo blogging on any platform - only for iPhone. • Photo services hosting with Google Picasa, compatible with any blog. Take photos with iPhone camera. Store and select photos from Picasa or iPhone library for display on your blog. • Picture posting at Google Blogspot (aka "Blogger"), using Picasa. • iBlogger's emitted HTML is now XHTML1.0 compliant. • iBlogger's HTML can be fully styled with CSS, now. Example stylesheet provided. 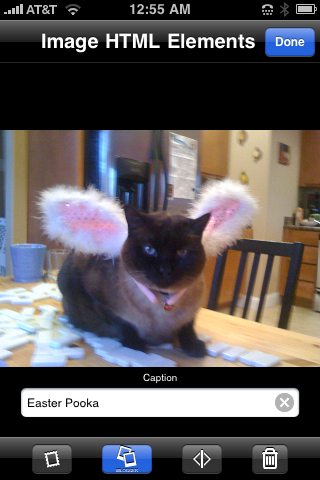 • iBlogger now handles images at full native resolution of iPhone cameras. • Image thumbnails, scaled via CSS. • Lightbox compatibility, built in. • Easy and fancy display of image captions. Easter Pooka is a beautiful cat! Posting this announcement to a Google Blogspot/Blogger hosted blog, using iBlogger 2, was a lot of fun. This is a screen shot captured from the iPhone during an iBlogger 2 session, and posted with a caption, all from within iBlogger. When will be the release of iBlogger 2? What About an iPad update? What's the status of iBlogger 2? Can I position images in the blog via wysiwyg or do I need to do so with HTML? How do I become one of the beta testers? How is iBlogger II beta test going? Everyone is longing for a blogging tool compatible with image uploading to a Blogger.com blog! iBlogger 2 is available on the App Store, now!